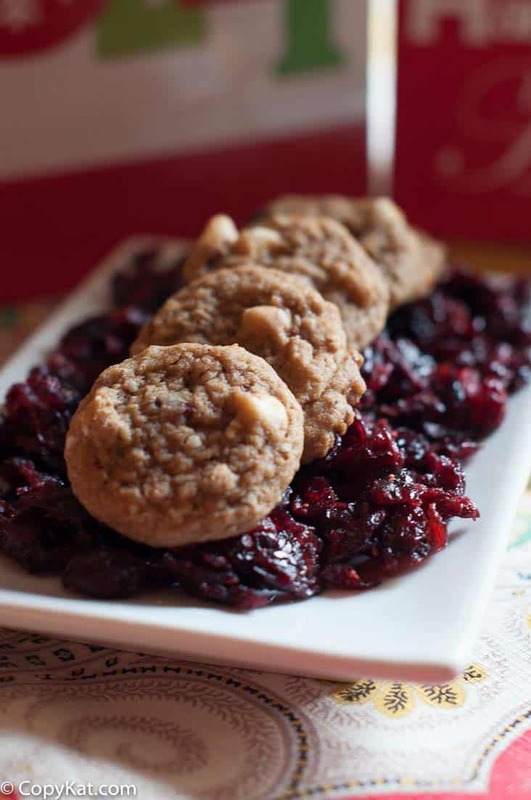 White chocolate cranberry pecan cookies are perfect when you want to serve a cookie that has the right amount of sweetness, and just a touch of tartness from the dried cranberries. Every year I can I like to participate in the Food Blogger Cookie Swap. The Great Food Blogger Cookie Swap is an organized cookie swap where you get to exchange cookies with other food bloggers. This year my partners that shared cookies with me were Like Mother Like Daughter. They sent to me some wonderful iced Gingersnap Cookies. Another one of my partners was The Balancing Mom, we must have been in synch as we did very similar cookies. She sent me some White chocolate Chip Cranberry Macadamia Nut cookies. What I love about this cookie swap is that it makes me try cookies that aren’t in my comfort zone. My personal favorite cookies are Pecan Sandies and Hello Dollies. I can’t go through a holiday season without these two types of cookies. These white chocolate cranberry pecan cookies have the right amount of sweetness with the cookie; the white chocolate adds a creamy element, and the sweetened cranberries are wonderfully chewy. The pecans give you just the right amount of crunch. These cookies can be packed and mailed well. They are a hearty cookie, so they are perfect to mail and share. I hope you give these cookies a try. They are super easy to make if you can make chocolate chip cookies you can make these cookies as well. These cookies are perfect for the holidays. Beat the butter until fluffy. Add both of the sugars until well blended. Add eggs 1 at a time, then vanilla. Add the flour, baking soda, and salt. Stir until well blended. Using a large spatula or spoon mix in the dried sweetened cranberries, white chocolate chips, and chopped pecans. Drop cookies by a cookie scoop onto a lightly greased baking sheet. Space the cookies out about 1 1/2 inches apart. Bake the cookies for about 15 minutes or until lightly golden brown. I love these cookies, just made them tonight and came out so delicious. Thanks Stephanie! I am glad you liked the cookies! These look so great, Stephanie! My family loved these cookies! Thank you for sharing the reciepe. I’m always looking for something new to add to my cookie tray. What are Hello Dollies? They are the seven layer bar cookies. Why they were called Hello Dolly I have no idea. 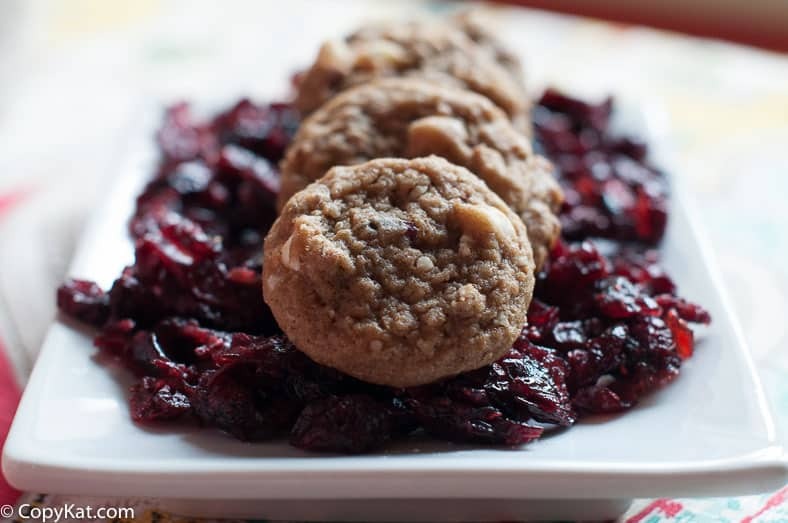 I loved your white chocolate, cranberry, and pecan cookies, Stephanie … and so did my hubby! Thank you so much for these delicious cookies … and the extra goodies you sent to! I hope you and your family have a wonderful holiday! I am glad you enjoyed everything! Wow these look great!! Going to make these.What do you think about replacing the white chocolate with orange zest – or adding orange zest to recipe – orange goes great with cranberry.